Hydrovane regulated speed rotary vane compressors come as standard with line reactors and built-in EMC filter. The inverter drive efficiently matches energy consumption with air demand, and the reduced energy venting system (REVS) also provides energy savings. This system supplies a low starting current and reduces off load power to 25% by rapidly venting internal pressure. As with the vertical enclosed fixed speed HV (ACE) series, the small footprint and low noise levels of the vertical enclosed HV (ACE) RS range allow for easy installation and point of use application. 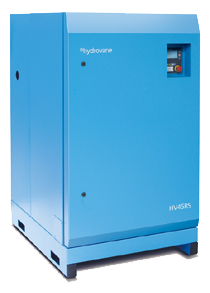 Additionally, receiver and refrigerant dryer options are available on the HV (ACE) RS 7 to 22 kW (10 to 30 hp) models, for a complete plug and play Hypac. An industry leading Advance 10 year extended warranty is available on all Hydrovane standard products (Unless specified).